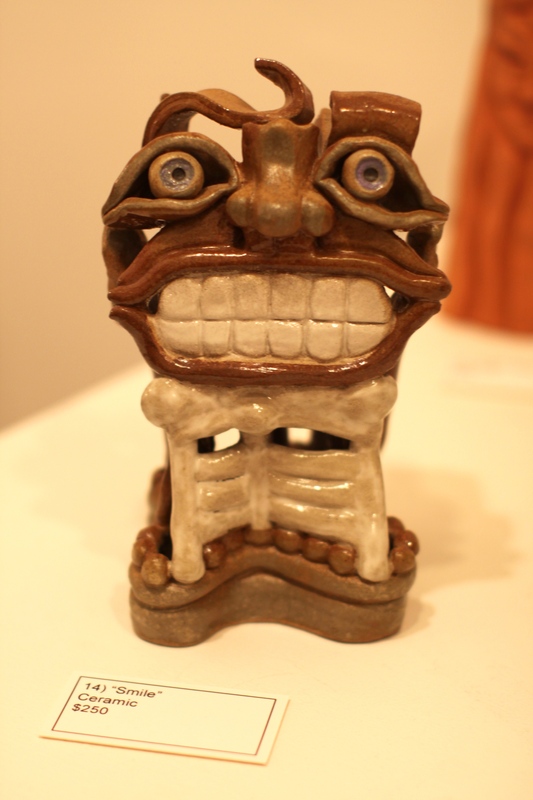 I went to Panza Gallery in Millvale on Wednesday. Took a watercolor to be framed and wanted to shoot Mark Panza the owner as he said he would be happy to be part of the People at Work Series. 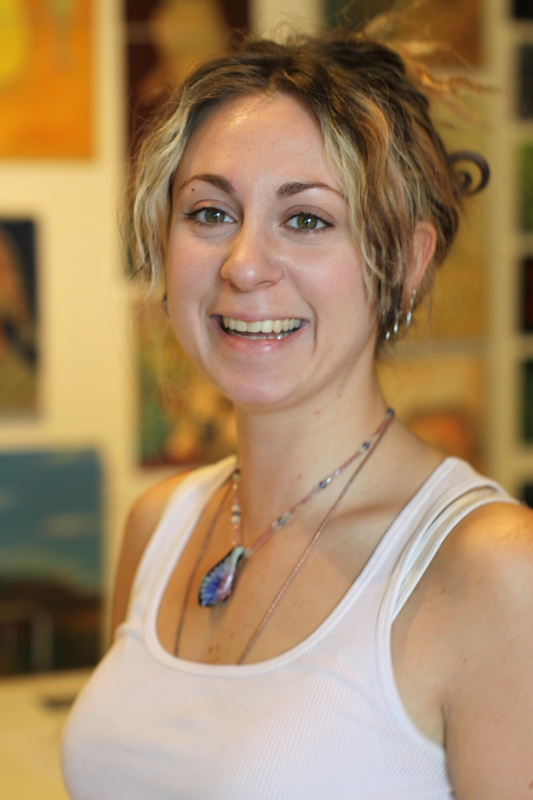 But something came up and his daughter helped me choose a nice mat and frame for my painting and I asked Jennifer if she would be part of the People at Work series. She graciously agreed after I explained the project. So I photographed her a few times in the gallery and then I asked her if she still made jewelry and she said yes but she said she had some ceramics downstairs. So right then and there I created a new project- I am starting an EMERGING ARTIST series of photographs! 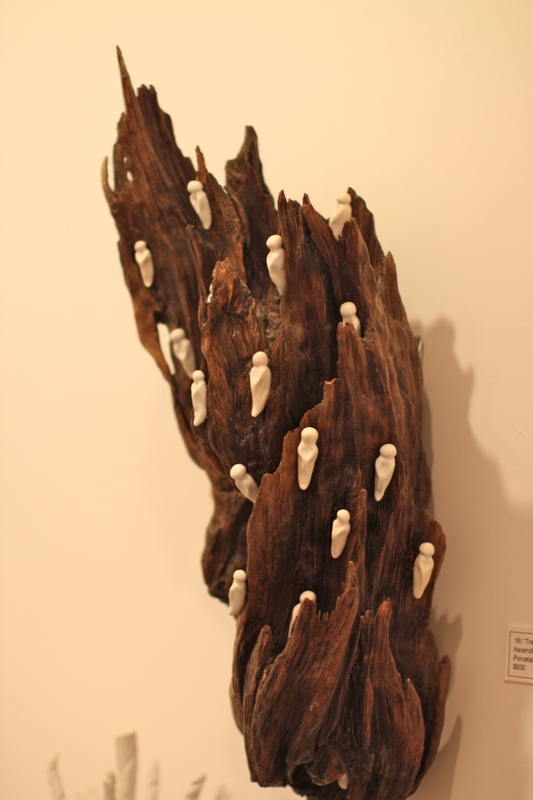 If you know any emerging artists who are in the area and would like to be featured on the blog I would be happy to photograph them and some examples of their artwork. Why not? It is hard to get started and I know a ton of people who make, buy and collect art so why not use the blog to show some of their work and them? 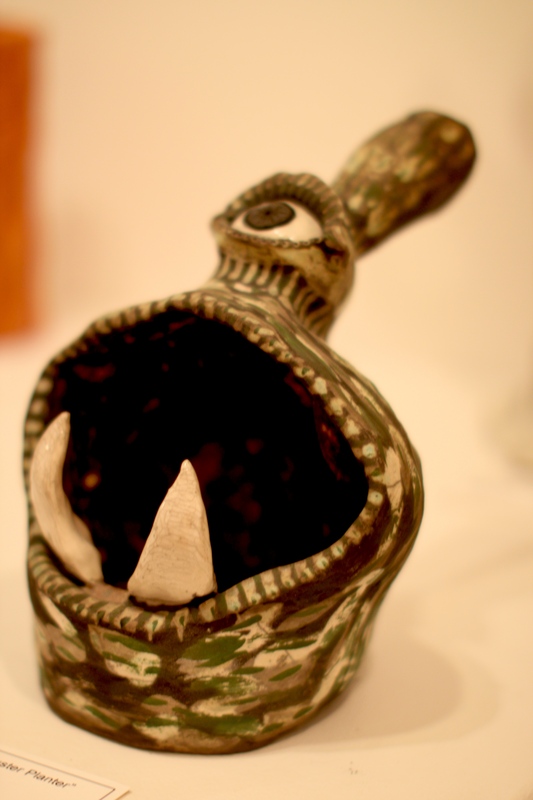 Jennifer just got her braces off and paid the final payment on them and check out the ceramics with the teeth. Surely her othodontist needs that piece in the office on display!!! 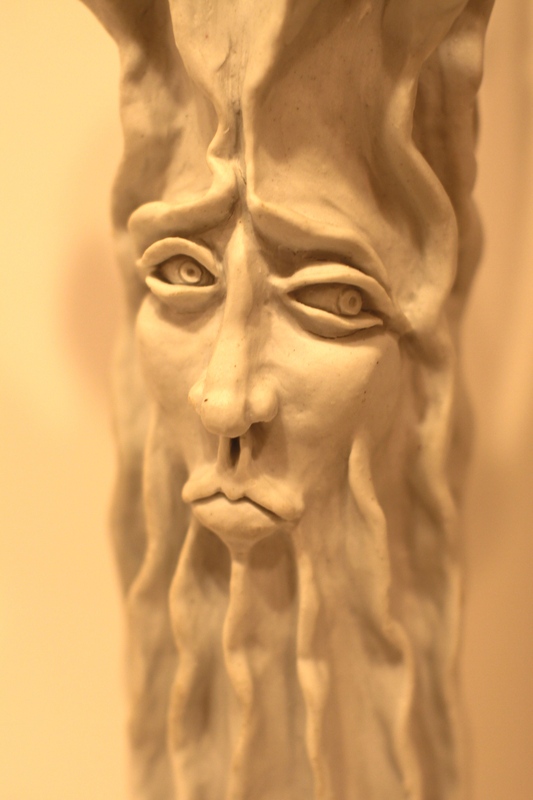 If you want to see more of her ceramics or jewelry just call Panza Gallery 412.821.0959.Or leave a comment and she can contact you. Jennifer is still in school AND working at her dad’s gallery, and when I was there she had opened the place, was working on invoices, taking calls and selecting frames and mats. Thanks Jennifer. One time Laura sent me tips on how to photograph food. I should have read it more carefully. It is not easy to make it look tasty and inviting. I am at a point in my life where I lay out all the ingredients for a recipe before I start making it. You want to know you aren’t missing something crucial. The phone rings, you’re listening to the radio, you lose count. At least with it all spread out and ready you can doublecheck you added everything. Today was soup making day. I made a double batch but did each one in a single soup pot as I never think doubling in one pot works the best. The key to this Best Recipe is the addition of the Parmigiano Cheese Rind to boil up with the vegetables. It really makes the broth delicious. This recipe is total veg and I don’t add the pasta in the soup pot as it soaks up all the liquid. You can make ditalini and put it in the soup bowl and ladle the hot soup on top. I followed the recipe to the letter, slicing the leeks just so. And there is no such thing as inexpensive Parmesan. I cut the rind in half. The cannellini beans go in the last 5 minutes and I used canned. 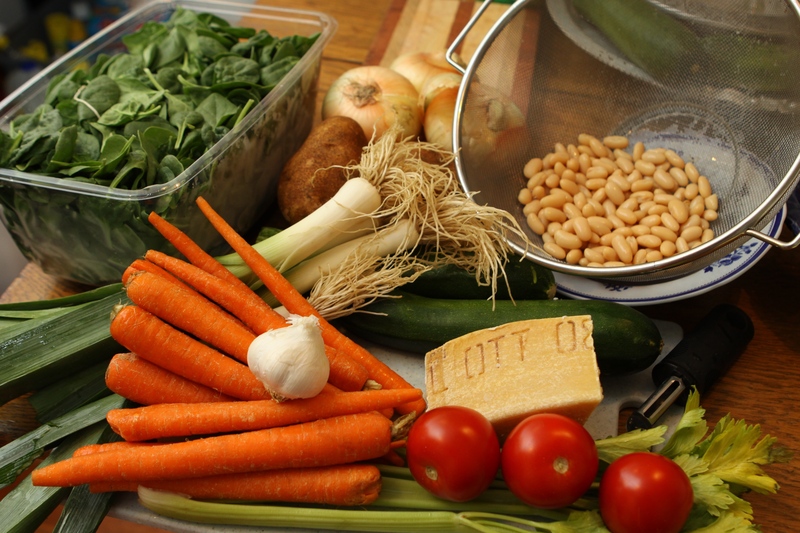 The recipe is from The Best Recipe cookbook(1999 edition) by the Editors of the Cooks Illustrated Magazine (page 28) or click here for their recipe for Hearty Minestrone. There are charts of other vegetables to use but broccoli is considered too strong for the soup and overpowering. And the reason it is called the Best Recipe is because they test all the recipes for a single dish and make it 100 different ways- with vegetable broth, chicken broth and the water with the wonderful soup rind- and they describe the pros and cons of each method and or addition. It’s good reading, about how and why they conclude they have found the BEST recipe! And I see there is a NEW Best Recipe out now. Yum! 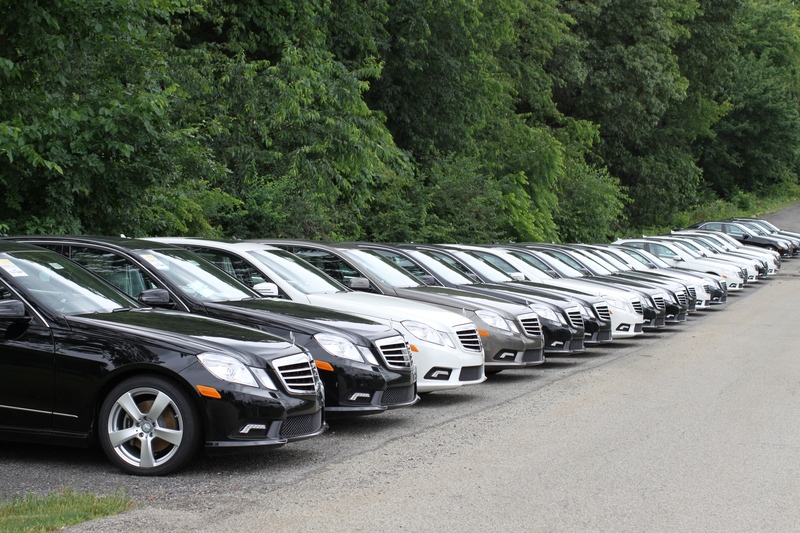 Saw this row of cars as I pulled out of a parking lot north of the city. 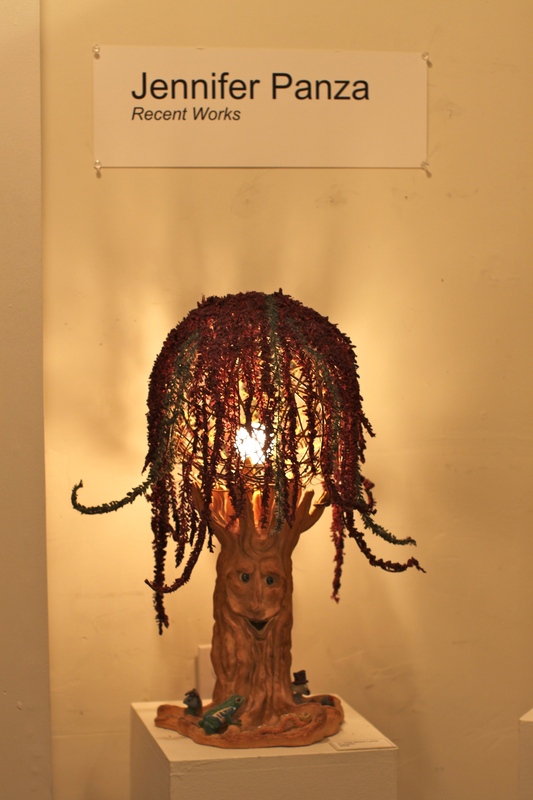 An example of one of the principles of art. As well as an orthodontist. Not sure how he studied for his credentials to taste pie but I know he does a great job. I think cherry is his favorite. Enough with the posts about cakes already, a main subject of my photography lately. Laura tells me that cupcakes are soooo yesterday and that Pies are ALL THAT! Magnolia Bakery just opening in Chicago now? She says they are late. I’m not sure because when I visit my sister in NYC I see people lined up around the block to get cupcakes on Bleecker Street at Magnolia still. But today’s post is for Rob, a dear friend of our family, who has left comments from time to time on the blog. You might see him zipping along in a cute 2 seater British car, on his way to a pie tasting! And the story is this. 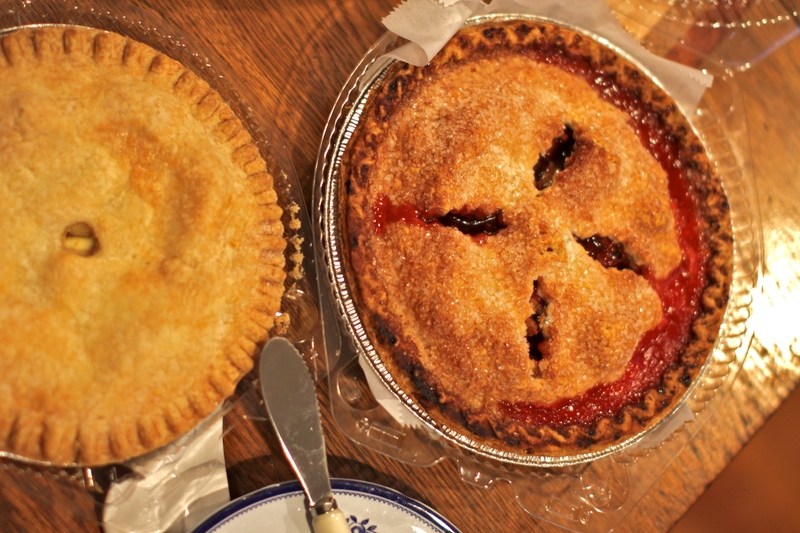 Apple pie on the left from the local grocery chain with the initials GE and the pie on the right? Patty’s Farm Market in Aspinwall on Freeport Road. That is where we got the pies for Mark and Erika’s rehearsal dinner at our house, nine years ago. Laura picked up the apple pie when we were shopping for supper ingredients. I looked at it as we put in into the back of the car and I just thought it looked uninviting. Not worth getting fat on….. so on the way home from the GE, I pulled into the Farm Market parking lot and gave her a fistful of bills and instructed her to buy a pie. And a box of fresh blueberries, too. “What flavor?”, she asked. “ANY!” – was my response. “Whatever appeals to you.” The one on the right is Strawberry Rhubarb!. Delicious. Tart and sweet combination. Summer. So Rob, this post is for you. My favorite PIE GUY. All three are manufactured in the USA!! Learned how to make a ® symbol on the Mac keyboard so thought I would use (overuse) it for this post. These names are familiar I know. And to people my age, a host of memories will resurface after you view these images. 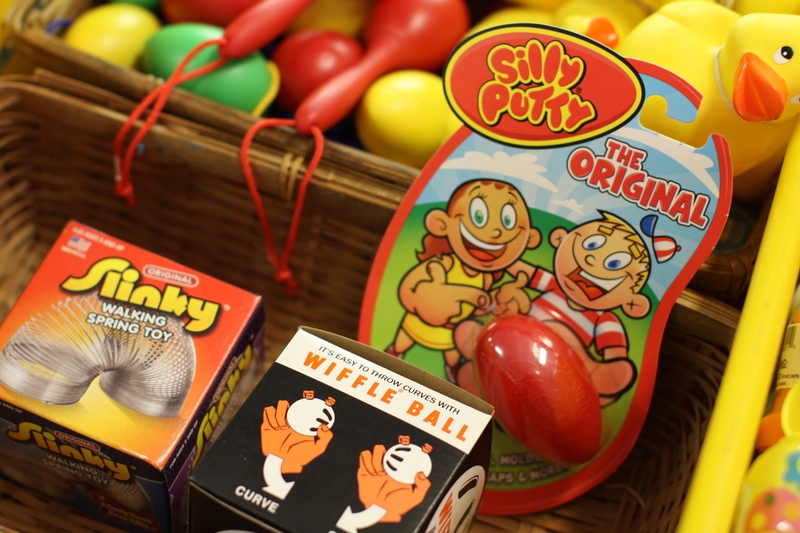 Silly Putty® is now owned by Binney and Smith and is more than fifty years old. Tons of this pliable stuff has been manufactured and sold in the past fifty + years. Slinky® has an interesting history, too, and About.com lists this memorable jingle but be careful cause it might stick in your head all day and you’ll remember the tune, too. They are manufactured in Holidaysburg PA.
You can always buy a new Slinky cause who hasn’t gotten one stretched out and tangled up irreversibly? And I remember when Wiffle® Balls came out ! Do you? They are still selling strong. Especially to college kids. I was in Shadyside Variety Store, picking up a few items for the grandchildren. I remember when Mark, Matthew and Laura used to shop here in the early nineties. We lived around the corner for two years and they could walk there to shop. So many nostalgic favorites- and the latest inventive toys from the Toy Fair, like Spot It which Sharon the proprietor demonstrated for me so I can play it with Anna and Michael when I visit. Keeping my brain sharp. I am fairly certain they’ll beat me. See the rubber chicken dangling inside the colorful hula hoops at the store entrance? 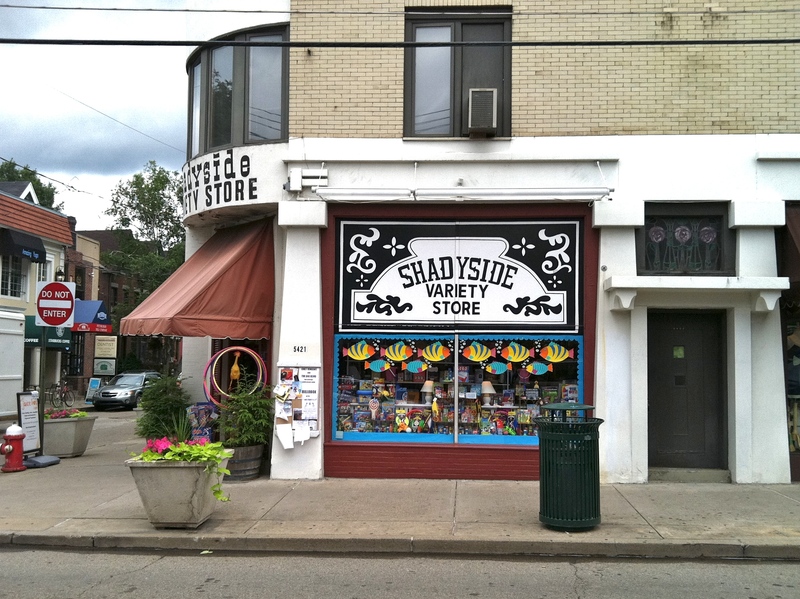 Next time the grandchildren come I am going to take them to the Shadyside Variety Store, give them each some money and see what they decide to buy after extensive browsing! The nicest guy from Texas,who just finished up a Robotics Conference at CMU, was shopping – he held the Etch-a-Sketch up for me when I was exploring the store for classics! Someone asked me the other day if I were a reporter. No, a blogger. Self-assigned! My friend G’s mother in Morris Plains NJ used to make these icebox cakes in the sixties. I always loved to eat a slice of one. And they still sell the cookies you need to make one. I hear they are difficult to find. I found a box on the top shelf of Giant Eagle supermarket right here in Pittsburgh and I saw them for sale in Kroger in Ohio. We are still missing the NABISCO bakery which is now a location for Google and the new gym, Anthropologie and some other stores. There is even a hotel in Bakery Square where the NABISCO bakery used to be. I am not sure if they used to bake these chocolate wafers in that facility or not. Found an article that these cookies were advertised in 1929 with this recipe suggestion! And the author of the article is correct- these cookies are always hidden on the top shelf in the cookie aisle. 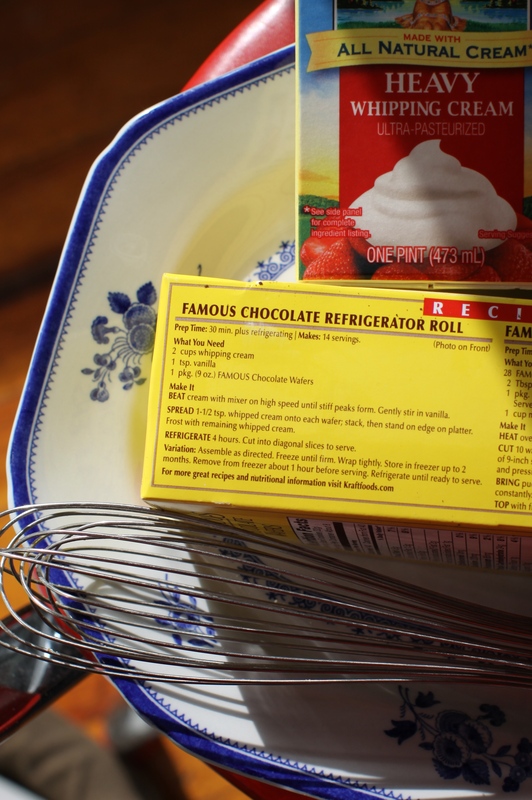 I’ve been thinking about making a Famous Chocolate Refrigerator Roll for a long time. 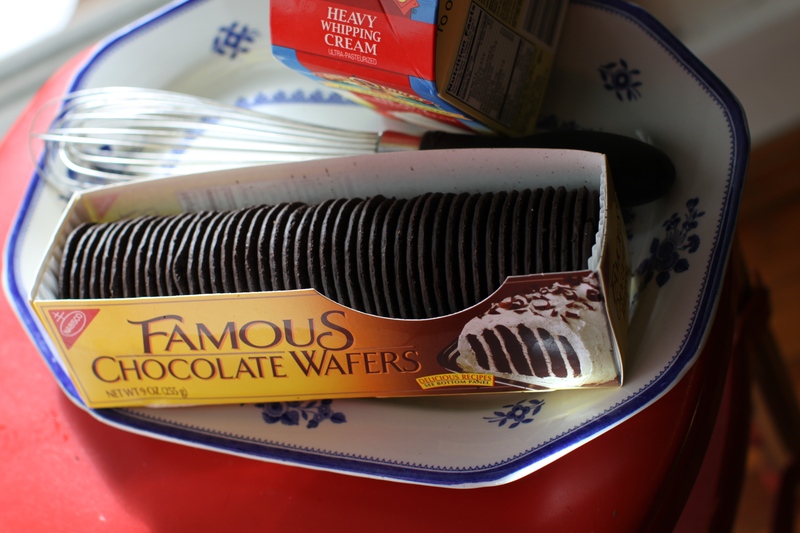 So I bought the Famous Chocolate Wafers and a pint of heavy cream to whip. 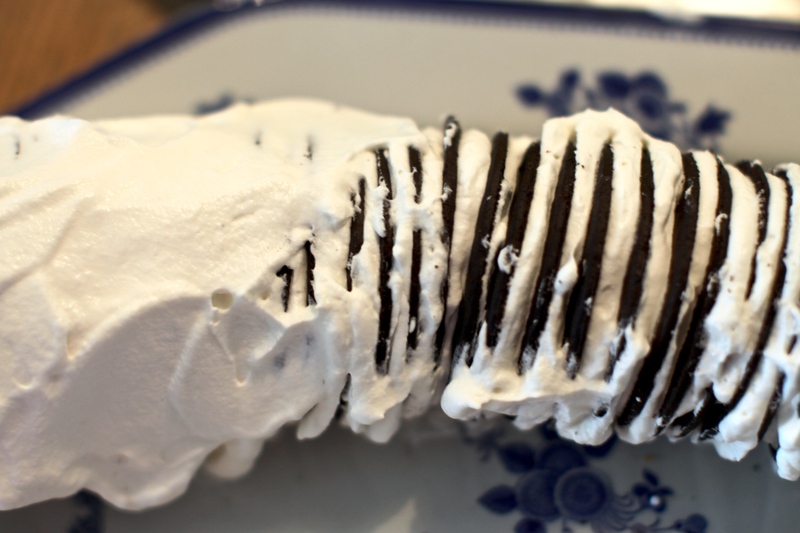 Mine did not look as neat and lovely as my friend’s mother’s dessert did when we were growing up. Once I covered it all with the leftover whipped cream it looked better. It is chilling now. Laura is coming in tomorrow from OH and I hope she will find it amazing when we slice it and it is striped. Milk chocolate is all I had for a garnish but dark chocolate garnish would have looked better. After you put it all together, it sits in the refrigerator and as I remember it, the cookies soak up moisture and get cakelike and soft, with the layers of cream in between. A no-bake dessert you just assemble and refrigerate. Anyone remember eating this as a child? If you want the nutritional information you can click here but just enjoy a single slice and have people over to share it! 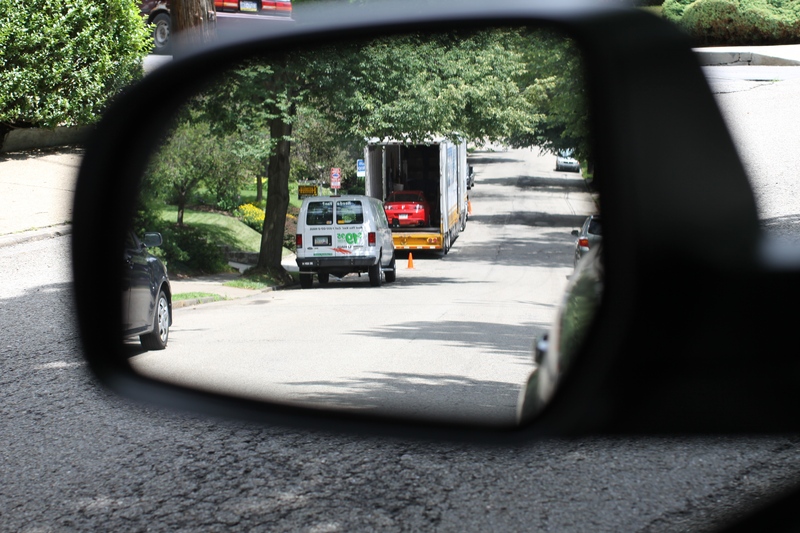 Drove by the moving truck on the street that runs into mine. After I drove by, I glanced in the side mirror. Pulled over with the flashers on and caught what I saw in the truck. Where can you see all that in one afternoon? BELLEVUE, PA And in the slideshow at the end of this post!! Head vases, a statue of Groucho Marx, autograph book, Betty Boop and an Atwater Kent Radio.…..oh, and another church for sale, too! After my 11 o’clock appointment, J and I headed for Bellevue. Who knew that tomorrow is the start of their 4 day long Summer Solstice Spectacular. 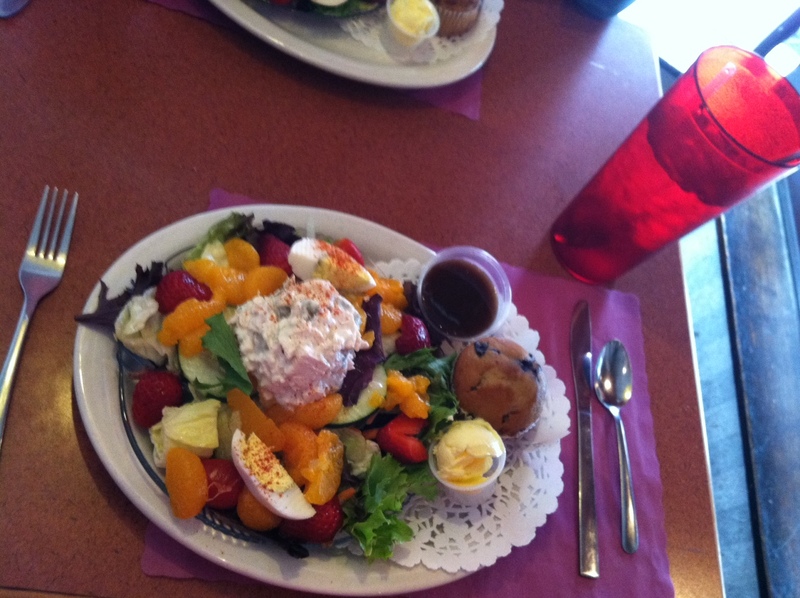 You can click here for the details We grabbed a quick bite at Joe’s Rusty Nail, an ice cream scoop of chicken salad on greens, some mandarin oranges and strawberries with balsamic and a blueberry muffin. A tall glass of ice tea. Cash or check, no cards. We walked down the block to a place we had driven by. Joyce’s Antique Emporium at 494 Lincoln Avenue in the heart of downtown. Oh my. We could have spent hours there, everything so carefully arranged and classified. Things you might have had as a kid or your mom had or the neighbors or your grandmother. I’m still thinking about the set of Pyrex bowls I left there and am thinking about going back if they are still there. Afterwards we stopped by the Farmer’s Market booths and I bought some strawberries that I made into jam when I got home- Joy of Cooking recipe. There was a shaved ice vendor. J bought the perennial Bloodroot to plant in her wonderful garden. We had fun checking out the antiques store with EVERYTHING. The Pickers Show on the History Channel needs to come and do an episode from this place. I am serious. We had the nicest conversation with the man minding the place and he was knowledgeable and full of great stories about the items in the store! 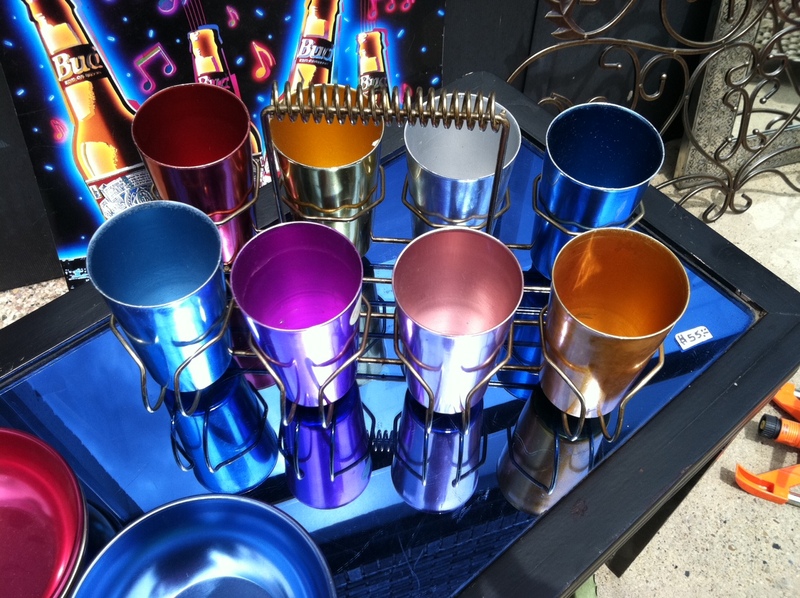 The aluminum glasses on a blue coffee table outside the store caught our interest and we couldn’t get over the variety of items displayed. Canisters Depression glass, Kewpie Dolls, Betty Boop, swizzle sticks, an accordion, bugle, toys etc etc etc….See the slide show below. Call them at (412) 761-1288. Wanna Buy a Brewery? Here’s Your Chance! It’s for sale! And it is BIG. You don’t have to make beer in it. I drove by it the other day. Stopped and took a few shots. 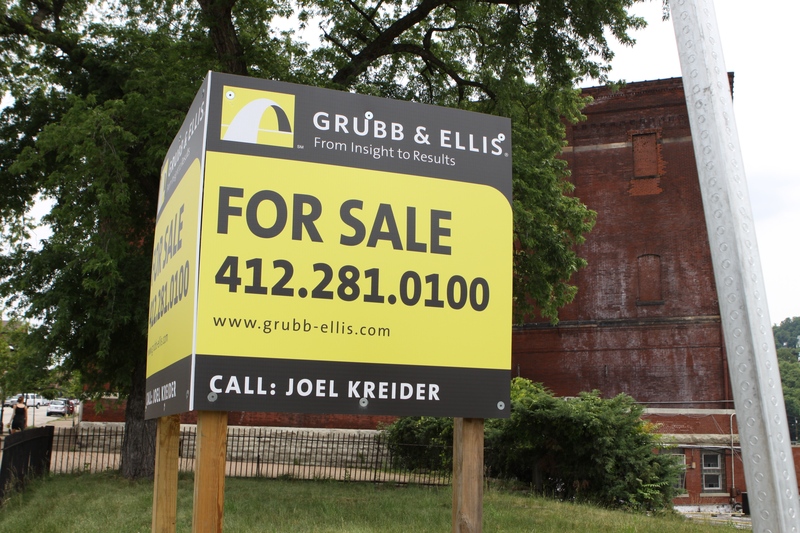 The enormous For Sale Sign gave me a jolt. 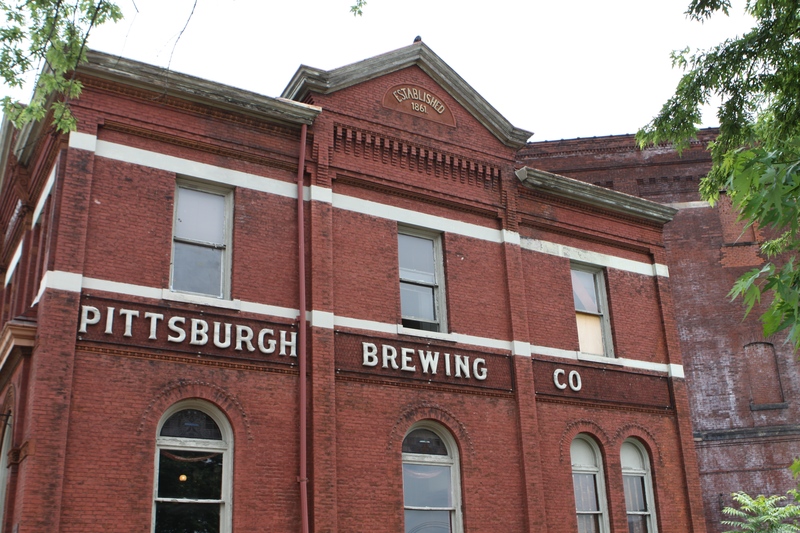 Pittsburgh Brewing Company is on the National Historic Registry. A Landmark. That status might impact some of your remodeling plans if you turned this place into condos but you know it’s a solid structure. It was established in 1861. They’ve knocked a lot of it down in the back but not sure why. A big pile of rubble would need to be cleared. 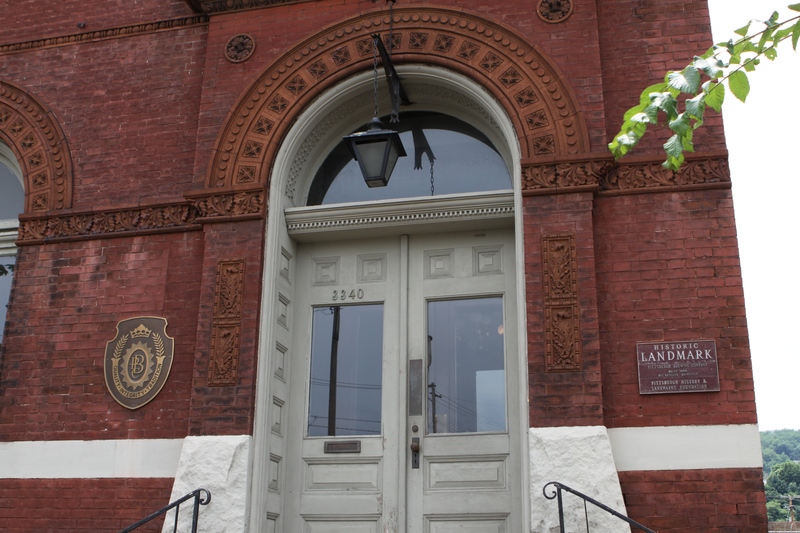 The Iron City brand has moved out of the city to Latrobe. I’ve actually been to an Ocktoberfest in this place years ago. Empty buildings that once held purpose seem sad to me. Especially all the churches around the city but even the brewery evokes feeling for the architecture, the magnificent details, the history, the immigrants who came to Pittsburgh and worked there, built it- the once busy place no longer being useful. Feels more than sad, it feels depressing. The abandonment. This place needs to be purchased and rehabed and made to come alive again. Someone with some $ (okay, some $$$) and creative ideas for the space. I have no idea the pricetag. A great location, minutes from downtown. There’s a wonderful view of Polish Hill, too. I could see the domes of Immaculate Heart of Mary, where Mark and Erika were married in 2002. This is the kind of structure you see in Preservation Magazine, needing someone to come and save it. Hope the right person comes along soon. Wanna buy a brewery> Here’s your chance! Even if you hadn’t thought of buying a brewery before you read this post, maybe you’ll consider it now! If you are interested you have to call for the details on the price. I was talking to my artist friend Bill Pfahl and asked if I could post a photo of him painting a scene of a church in Lawrenceville. Part of my people at work series. He agreed. Turns out I shot him in 2006. Tuesday I’m going to ask when he’s painting, if I can find him in the city and shoot another portrait. 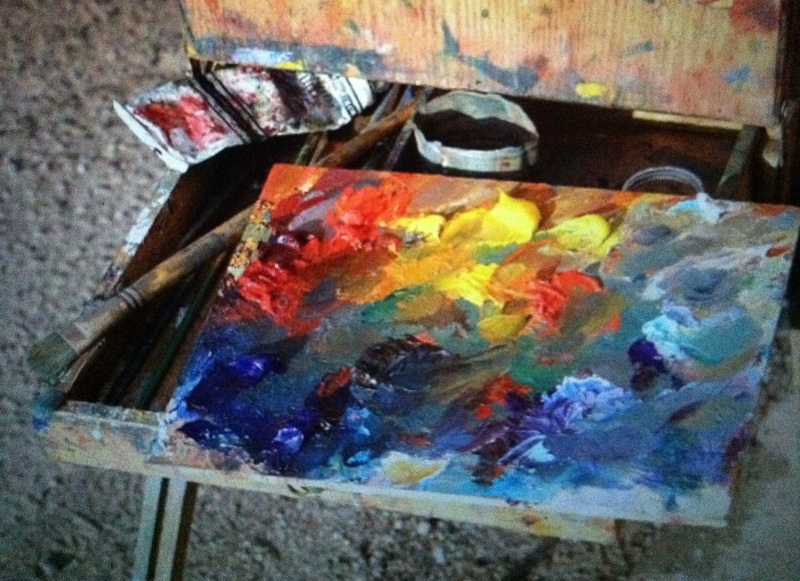 Here is his palette. He painted the church where Mark and Erika were married and gave it to them as a gift. It hangs in their front hall where it changes as the light changes throughout the day.